We would just like to thank you, Greg, Kim and servers on presenting a beautiful, delicious and a wonderful meal for the West Pines Villas annual Christmas dinner. Everything was very tasty and lots of it. Merry Christmas and a Happy New Year. Just a quick note to say thank you. Our party at The Dunes on Saturday night was great in no small part to the service from your staff. Please pass on to the servers and cooks our sincere thanks for a job very well done. The food was excellent and prepared to everyones satisfaction. Hot and prompt. Great day considering the time of year. Course was in great shape. Hoping the weather holds on to allow us to play again this year. Staff was friendly and restaurant was great as usual as well. Best affordable golf in all of Kamloops. Challenging and well maintained. Beautiful golf course and club house! Excellent staff, events and dining. Would recommend for a fun day of golf, or a romantic dinner for two, or take the whole family for breakfast. Laid back atmosphere with a touch of class. A true gem in our town. First, a big thanks to all the staff – yourself, but also the night of the event! It was very relaxed and definitely comfortable for our new format and challenges for us to adjust to – THANK YOU!!! And please thank the kitchen staff in the background! Thank you Bill. We had a fantastic day thanks to you and your staff. I only heard good things about the venue and food. We really appreciated everything. Good morning Bill: just a quick note to express our club members gratitude for a fabulous evening! The venue, food, staff and setup was superb. Amanda went out of her way to seek me out to be sure everything was okay, and Jenna was most attentive. I don’t know the names of any of the others, but there are no complaints about anything! Great job! Hi Bill: Thank you for treating us to a great event and having your staff be so awesome to all of us. The food was great and everyone complimented on it. Thank you again for being so accommodating. Hi Bill: I have talked to quite a few of golfers and dinner guests about the July 29th event. All the same feedback..an excellent job done by both the pro shop and Food Management staff. Well organized as to the course itself and the food was great. Your staff should be commended as they were great and all seem to enjoy their jobs which reflects in their service. Everyone had a great time and want to do it all again next year! To Leah: Thank you so much for everything, you are so nice and very kind. We really enjoyed ourselves at The Dunes, I must say the wedding was spectacular and a lot of fun. Thank you once again Leah, you are the best. Good Morning Bill: First of all, I would like to say that you, and your staff did a great job in hosting us on Saturday. Everyone enjoyed the golf, food and hospitality. Thank you very much for everything. Hi Bill: Our grads are still Facebook talking about the party. It was so much fun and part of that fun comes from the room, the view, the location and definitely the food and service. It was impeccable. Hi Leah: I want to send a thank you to you and your colleges for the great presentation and service for the Anniversary Party on Sunday evening. Everyone expressed how much they enjoyed themselves. All seemed to really appreciate the great buffet that you presented. Many thanks. Such a great venue to work with. Aglow Bridal loves decorating here and appreciated the kind and amazing staff that work here. Hi Bill: Things went very well on Saturday. The food was awesome and came out right on time. The crowd really loved the variety of the menu. Your staff was so awesome! Cheerful, efficient and super-helpful. Hi Bill: The party was great. The venue was appreciated by all who attended. Your staff looked after our every need. Many of the guests commented on the great food and service. Many thought the ham was out of this world. Several groups did not know that your restaurant provided this type of event service and commented that they will come back again. No one complained about anything. We were very pleased as you promised us that would be the case. Hello Leah: I just want to say THANK YOU so very much for all your help on Sunday. It was very much appreciated . We really were impressed with all the services you provided for us ( even cutting the cake!!) we cannot say THANK YOU enough. Year two of the RM tournament at the Dunes was nothing short of excellence. The feedback I received from our RM team was very positive. The food, staff and course were all at a high level which the Dunes I know delivers. Thanks for another great tournament. Looking forward to next year. Just a quick note to say thank you for all your help on Friday. The team had a great time and we really enjoyed ourselves. I appreciate you accommodating on short notice. Everyone had a great time and the food and service was fantastic. Thanks so much. Everything was great and we felt as though we were looked after very well. 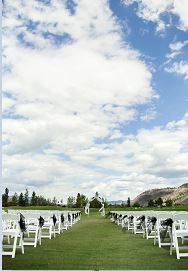 Would definitely recommend the dunes to anyone looking to get married in Kamloops. I just wanted to send this email this morning to extend our sincerest gratitude to you and your staff for the incredible service we received at our tournament on Friday. Your organization and communication made my job so much easier. Matt at the pro shop was great to deal with. He was always quick to help if we needed anything and was very patient at the end when we were trying to collect everyone’s score cards. A Big thank you also goes out to Ron. He was absolutely wonderful and made registration (which could have easily been very chaotic as we had some customers who wanted to make changes to their teams when they showed up) so easy for me. I was able to make sure our customers were happy and it could not have gone as smooth as it did without him. The kitchen and dinner staff were terrific as well. I heard nothing but great things from our customers about the food and service they received. You have a very solid team of people there and because of The Dunes we were able to give our customers an amazing experience. I know we would love to book with you guys again for next year. I also know that this is only possible if your experience with us was great as well so please let me know if there were any complaints or issues with our staff or customers or if you have any feedback at all. Thanks again Bill. We had a really wonderful evening! Thanks for hosting us yesterday. The course was in great shape and the food was delicious. Nothing but positive reviews from all players and coaches! I just want to say thank you for a great golf experience at The Dunes. The course is in great shape, especially the greens that are second to none. Your staff exceeded our expectations. The pro shop staff went out of their way to get us going in the morning and even recovered a wallet that was left behind and got it to its owner in Kelowna. The restaurant was open at 7:00AM which was a big help to our group and the service and food were first class. Thank you for a great experience and you can count on us returning next year. On behalf of the C.N. Pensioners Dinner I like to thank you and the all the Staff for the great meal and service we received for our Dinner. Everyone were well pleased and happy with the service and the Food and went away very pleased with every thing. Please thank all the Staff for us. All 3 of us who volunteered from the Westsyde Community Development Society to staff the Pumpkin Patch table agreed that it was a great idea. And please thank your staff on our behalf for their efforts in laying the pumpkins out! The location of the pumpkin sales table worked very well – people had no trouble finding us. We heard only positive remarks from the people who wandered through the patch, many of whom took photos with their children holding pumpkins, sitting on the bales of hay. Those bales, strategically placed around the patch, were a brilliant idea. People really did make good use of them for photo ops. The great variety in shapes and sizes of pumpkins, of course, was a big selling feature! The sheer number of pumpkins to choose from helped a lot. We could have continued selling past 2:30, as many of the vendors also wanted a chance to purchase a pumpkin after the Craft Fair was over. Hi Bill, I just wanted to say a HUGE Thank you for a sensational day last Friday, our Golf Day was a big success! Your team is great to work with, they’re very organized, professional, good communicators and they made my job much easier! Thanks for accommodating our special requests like the Drinks girl out on the course, Hot dog and Bevvie at the turn & the Hospitality table on the 10th – appreciated! The course was in good shape and everyone had a terrific day, thanks again for making it a success! I hope that we can do a repeat next year! Thank you for arranging such a great golf experience for our Panamanian students last Saturday. They all really enjoyed it, as did I! Lunch was superb. Big thanks also to Nick and your team of instructors on the course. Thank you for accommodating our group on Friday; the facility was excellent, as was the meal. I just wanted to send you a quick email and let you know how UNREAL you and your team are at The Dunes!!!!!!! Our wedding was absolutely perfect and we had so much fun!!! The food was amazing and the all the staff were awesome behind the bar, serving the buffet, and cleaning up! Everyone was telling us how nice the venue and the food was! And our vegan friend Geoff also loved his dish that he had as well!! It was so special for us for you to be celebrating our day as well, I hope you had fun!!!! Thanks for helping us to have the best wedding ever. The venue was amazing! Thanks for everything we had a lovely evening. Our friends and family loved the dinner. Staff were very helpful. Just to let you know we will be away for a few days. Talk to you next week. Thanks again, great venue-I would recommend it. Sincerely. Hi Bill, I’d just like to express, on behalf of the Norkam Beef on Fire guys, our sincere thanks for helping us put on a great round of golf and supper! The course was beautiful, the staff was AWESOME (with a couple of Norkam grads helping out – Ryan and Nic), the supper was really good, and the beer special was great! Thanks also for the door prize rounds and appy coupons, the guys will hopefully be using the this summer! Anyway, thanks again for the time and service, we really appreciated everything! We had a wonderful time, and owe you a big thanks for going the extra mile with great suggestions, solving issues quickly and doing a lot of the set up for us, in addition to the unexpected ‘cake cutting’. The meal was very good – we had several compliments on the food quality and cleanliness of the Buffet, prompt service with plate removal, etc.. Thank you again for all your help – we will be recommending the Dunes to our friends and co-workers. I also wanted to say a HUGE thank you to you and the staff out there. Each and every single person we had contact with was absolutely amazing and friendly. Our bridal party is still talking about how much fun we had driving around in the golf carts! Im so happy with the decision to do everything out at the Dunes!